Bhawani Sannyassi Dayal was the son of the Jariam Singh, a former President of the Transvaal Indian Association. He received his early education at St Cyprian's School and the Wesleyan Methodist School in Johannesburg. In 1904 his father sent him to Bihar in India, where tutors were engaged to teach him privately. In 1910, when he was 18, he married Jagrani Devi. He returned to South Africa in 1912 with his wife and baby son, Ramdutt. A year after his return to the country, at only 21 years of age, he was elected President of the Young Men's Indian Associa­tion in Germiston. Dayal was one of the organizers of the Indian strike led by Mohandas Gandhi at Newcastle in 1913. This was part of the Satyagraha Campaign, the passive resistance movement against pass laws for Indians, which started in 1907. He was subsequently sentenced to a term of three months' imprisonment with hard labour, together with his wife and Ramdutt, who was then only two years old. Dayal, who was proficient in Hindi, was actively involved in journalism from a very young age. He edited the Hindi section of the Indian Opinion in 1914, and the Dharma Vir in 1917/18. He organized the first and second South African Hindi Literary Conferences in Ladysmith and Pietermaritzburg in 1916 and 1917, and in 1922 he founded the Jagrani Press at Jacobs in Durban in 1922, where, from 1921 to 1925, he edited, printed and pub­lished the weekly Hindi in both Hindi and English. In 1920 he was elected a member of the Bijola-Dewar (Rajputana) Commission appointed to investigate the grievances of passive resisters. He attended and partici­pated in many other political, social, literary and religious conferences during his short stay in India between 1919 and 1920. This was his second visit to India. He returned to India for a third time from 1929 to 1932, when in 1931/32 he worked as an editor on the staff of the Aryavarta in Bihar. 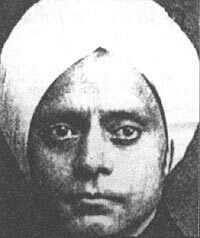 Dayal represented the South African Indian Conference (SAIC) at the Indian National Congress at Amritsar in 1919 and at Gaya in 1922 and was instrumental in getting the SAIC affiliated to the Indian National Congress. In 1925, when the SAIC sent a deputation to India specifically to protest against the Class Areas Bill, Dayal was among the members. A year later he established the Pravasi-Bhawan, consisting of a fine library and a free school, at Bahuara, Khargarh near Sasaram in Bihar where he had attended school. The honour of becoming the first South African to be admitted to the Order of Sannyassis was bestowed on him in 1927. Members of the order are known for their devotion to the service of mankind. During the same year Dayal was one of the SAIC representatives who guided Indian resisters in the northern districts of Natal, particularly in Utrecht and Vryheid, and explained the implications of the Asiatic Act of 1927 to them. He visited the various coalmines in the districts where Indians were employed and investigated the working conditions of the Indian mineworkers. In 1928 an Indian Education Commission was appointed in Natal at the instigation of Srinivasa Sastri, the Agent General of India, to investigate Indian education in the province. Dayal assisted K.P. Kitchlu, an education expert from India, in the investigation carried out by the commission. He also gave evidence before the commission on behalf of the Natal Indian Congress, of which he had been Vice-President since 1921. As a representative of the Natal Indian Congress he investigated the Dannhauser colliery disaster and distributed relief money to the dependants of the Indian miners who had died. When he left South Africa to settle in India in 1929 the NIC paid tribute to him in public. It was said that his departure would be very keenly felt as his name was closely associated with public life in South Africa and his service to the Indian community had spanned many years. In 1931 Dayal and Pandit Benarsidas Chaturvedi published a report on the emi­grants repatriated to India from South Africa under the assisted emigration scheme, and on the problems experienced by returned emigrants from all colonies. Their findings were published in 1931 in a report entitled Public opinion on the assisted emigration scheme under the Indo-South African Agreement in 1931. Dayal returned to South Africa in 1936, and was elected President of the NIC in May 1938. By December 1938 he had established NIC branches throughout Natal and enrolled over 5 000 members. In 1939, before his final return to the country of his birth, he led a campaign against the proposed segregation measures by South Africa's Union government. He was the author of considerable books in Hindi, namely History of passive resistance in South Africa, My experiences of South Africa, Story of my prison-life, Biography of Mahatma Gandhi, Indians in Transvaal, Natalian Hindu, Vedic religion and Aryan culture, education and cultivator, and The Vedic prayer . Dayal and his wife had a second son, Bramadutt. His wife, Jagrani, died in April 1922. In 1932 the Durban Corporation honoured him by naming Dayal Road in Clairwood after him.